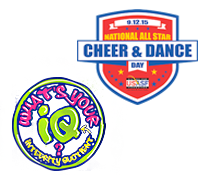 The United States All Star Federation (USASF) is host to The Cheerleading and Dance World Championship annually. More than 120 USASF/IASF member event producers across the U.S. and in over 40 countries around the world qualify top teams at their premier national championships to compete at The Worlds. This international event brings together more than 11,000 cheer and 4,000 dance athletes to vie for world champion titles in senior and international club divisions and categories. The first Cheerleading Worlds was held in 2004 and the first Dance Worlds in 2007.